For most people, ziplining isn’t a daily activity they get to do every morning before work. It’s a thrill ride, an adventure that sticks with you long after you’ve disconnected the harness and planted your feet back on solid ground. In the Hawaiian Islands, ziplining is essential. Sure, you can live without it, but once you watch someone else fly down the line, you know that you have to get up there and experience whatever it was that made them scream with delight. As you’re getting yourself pumped up for your cruise over the emerald green of the island, be sure to keep a few things in mind. While your zipline guide will give you plenty to think about while you’re getting ready to launch, these very simple tips will help ensure that you get the most out of your zipline adventure. Before you even buckle in, you get a quick training session on how the zipline works. Beyond thoroughly explaining the safety procedures, your guide will also likely give you some pointers on where to look and any landmarks you should keep an eye out for. Pay extra careful attention to those safety tips! Ziplining, at its core, is a very safe activity – when you follow the instructions. You’ll be moving at a pretty high speed, so if you blink or kind of get lost in the moment, it’s easy to miss out on something. Remember, you’ll be flying over some of the most stunning landscapes of Hawaii and you never know what beautiful sights may be nearby. Sure, you’ll have the memory of the zipline forever, but won’t it be nice to have pictures to share with your friends? Most Hawaii ziplines are designed so that your hands can be free, giving you the opportunity to snap some photos or video of the lush terrain that surrounds you. Don’t get lost behind the lens. Remember to be in the moment and enjoy your time! To be able to make the most out of your zipline experience, you’re going to have to actually get on the zipline. 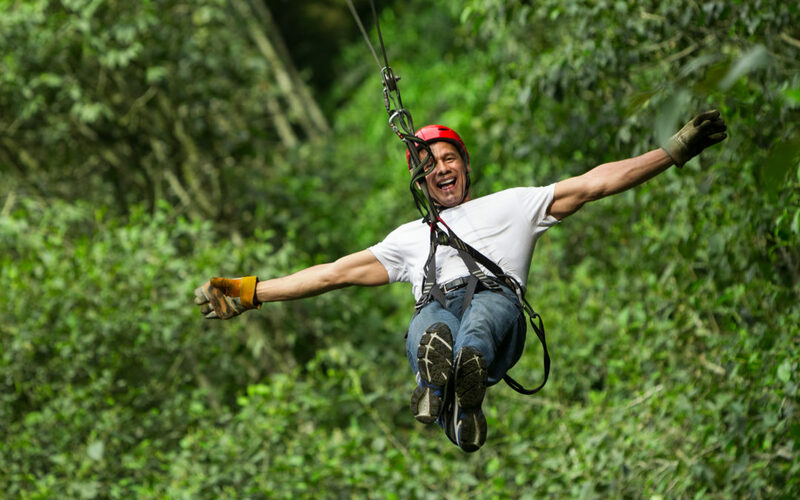 As we mentioned before, ziplining is incredibly popular in Hawaii, so make sure to reserve your spot ahead of time. Even if you feel like it’s the off season, book ahead of time. Hawaii doesn’t really have an off season. Nothing can ruin a good time more than losing something valuable. As you’re zipping across the sky, you don’t want to have to worry about your personal effects. If it can’t be replaced, or if you think it can be blown off while you’re soaring, you should probably just leave it behind. Which Venues Offer Tandem Ziplining?